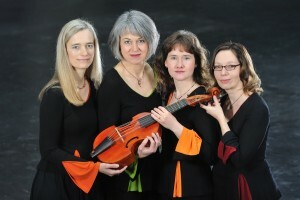 Inspired by the intriguing sound oft he viola da gamba, the musicians Barbara Pfeifer, Sabine Kreutzberger, Adina Scheyhing and Franziska Finckh founded the viol consort Les Escapades in 2000. The name refers to intrigues or liaisons and gives the flavour oft the ensemble`s programmes which create space for a new listenig experience. Besides their concerts as a viol quartet they perform frequently with other instrumentalists, dancers, actors and singers, for example with Miriam Feuersinger, soprano from Austria and winner of the „Echo-Klassik“ 2014. Les Escapades has become well-known by playing concerts in the European area, so, for example, at the Festival for Early Music, Daroca/Spain, the SEMF-Stockholm Early Music Festival) and also by numerous CD recordings.